I am offering Speedy Stitchers at what I believe is the lowest price on the internet. If you find a lower price in stock online, pm me with a link and I'll beat it. Order 12 or more for $6.49 each with free shipping. And how about a Kid's Group Special, anyone buying 12 for their Scout troop, 4-H or other kids group will pay only $66.99 shipped to you. That comes to just $5.58 each to your door. This is a Kid's Only special price. I saw on the BSA website they are getting $19.99 each for the same Stitcher. Kit includes the awl, a heavy duty straight and curved needle, a fine needle, a bobbin with 14 yards of heavy duty waxed thread and instructions- all 100% made in the USA. The Speedy Stitcher is a must have for every homestead, deployment kit, household tool box and more- you can sew heavy duty canvas, nylon and other fabrics. Use it to repair all kinds of stuff- even Jeep tops- or to sew custom gear. I am in for 2. When ya have the time. WOW! That's an unbelievably good deal.....I'll bet the one that I inherited from my dad cost more than that and he bought it in the late '50s! At my price it may be cheaper to buy a whole new stitcher than replacement needles and thread. I won't be shipping for a week or so, so no rush. Awesome! Send me a PayPal bill for 2 plus shipping. PM me if you need my address. 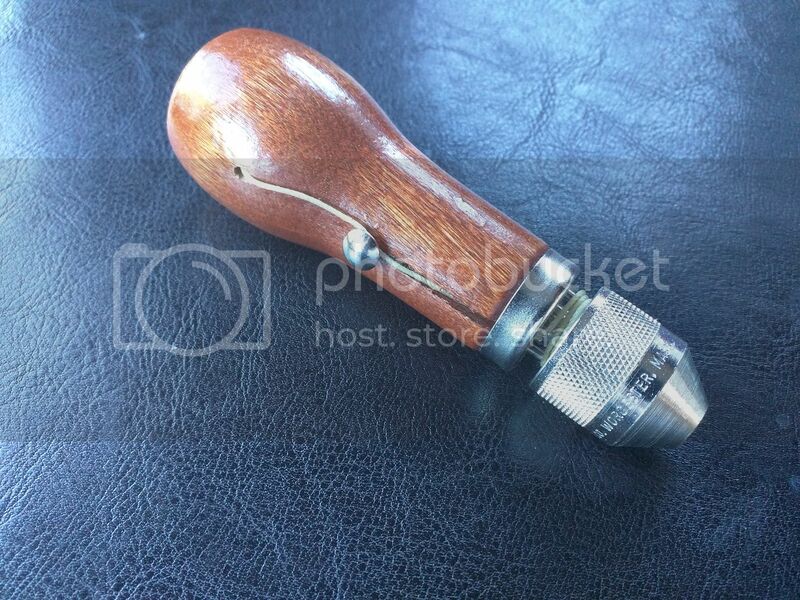 This might convince me to go back to an awl from saddle stitching. Any idea if these will fit the same needles Tandy sells? If not I can compare them when they arrive. I don't know if the needles are the same size as the Tandy version, please let us know if they fit when you get the Speedy Stitchers. I just want to point out for those of you considering buying two, that comes to $20.33 with priority shipping, or $10.33 each. You may want to consider getting 4. With free shipping the cost for four comes to $27.96, or $6.99 each. I want you to get the best buy. OK. I will take 4 instead of 2 then, please. Let me know when you are ready. Thanks! Send it whenever you would like JB. I'll be shipping at the end of next week as long as my shipper does his job. Ok, make it 4 then. Yep. It's good to have spares, and I know a couple of people who could probably make use of them. Forgive my ignorance, but can you use these with leather? Well then please add one to my tab! Mike how much would 5 of them be shipped? I did tell my buddy about the chute but hes been pretty jammed up so it may be a bit before he can get in touch with you. 5 would be $34.95 shipped ($6.99 each) and please tell your buddy that chute is his when he is ready. Just a bump for the weekend crowd. After waiting for the truck all day, the trucking company just informed me that I won't have my delivery until Thursday. That's why I generally pick the stuff up myself, but this was too long a haul for me. Considering the recent weather... No Sweat from over here. I am sure you will let everyone know... when things are good to go. I am not in a hurry for them. It's too good of a deal to care about shipping times. My R/C hobby has me accustomed to waiting 6 weeks or more for stuff from China anyway. I have all the orders that have been paid for packed and ready to ship in the morning. There are plenty more for those who are interested. I'll be along in the next day r two. Got it done. Paypal sent for 4. Mike, Wilderbeast really is offering a sweet deal. I just got "The BUDxx Catalog" ( the one that's full junk knives and cheap fantasy knives ). They have a dead ringer called a Speedy Stitcher (same name as Mike's) selling for $16.99 plus shipping. Mike is offering one for $7.49 plus shipping or buy 4 or more for $6.99 each, with shipping included. Thanks for your comments Tom, much appreciated. Christmas is just around the corner.....I'll take 4, Mike. You've already been paid! They are boxed, labeled and will be in the mail on Monday. The post office closes early on Saturday. Thanks for the cost savings & speedy delivery! I appreciate your extra thought in making sure how things worked out. I admire the space saving packaging filler... Beats bubble wrap or foam peanuts all to heck. Everything is good! Thanks Mike! Thanks for pointing out the third needle, I completely missed it when I was checking one out prior to listing them. I thought you would appreciate the packing material more than a handful of foam peanuts. Mine showed up either today, or yesterday, but I only made it to the post office today. First impression is WOW! These are so much better than the ones Tandy Leather sells. They have a solid, heavy feeling. The wood handle is more hard and dense than the Tandy version. The thread bobbin is steel instead of plastic. The knurled collet is a nice big one that you can tighten by hand instead of needing a wrench. These are a "10" compared to Tandy's "5", in my opinion. I've stitched a lot of stuff together with a Tandy Awl, and this design addresses a lot of the complaints I had using the old one. The thread tension post is a great addition. The Tandy needles will not fit this stitcher, however, so if you break a needle you will have to find them elsewhere. This isn't really a big deal, because it is unlikely you will ever break a needle, but it's worth mentioning. 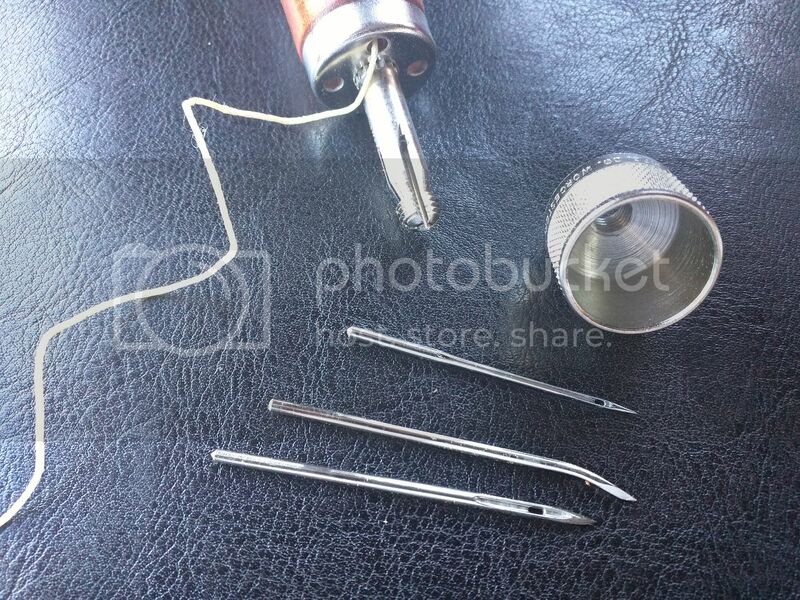 They come with 3 needles each, for different applications, which store inside little pockets under the collet. They also came with a full page instruction sheet. The Tandy version has no instructions, so you are on your own if you don't already know how to use one. Anyhow, I'm very pleased with these. If you think you might want to get into leather work or modding your own packs and web gear, this is a tough deal to pass up. I will post a video in another thread. I have used them enough to sew up stuff and will mention a couple of things. It is posted in DIY and Homemade Gear. My Stitchers and other stuff showed up today. It's like my birthday all over again every time a package shows up from Wilderbeast. Thanks again, Mike. Seems to me if you were to clamp the edge between a couple of slats right at the stitch line it might be easier to handle the thin stuff. I dont know for sure- the material might slip around. If it would stay put, you could position it so you were looking down the edge with left and right on each side doing their thing. Myriad ways to hold the jig in place and could mark stitch spacing on the edge. 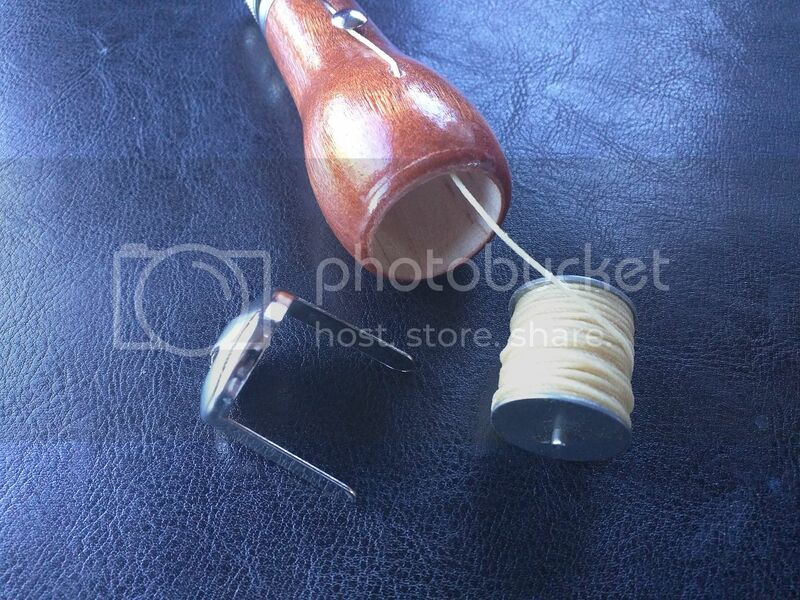 Google "Stitching Pony". Easy to make. In fact Dave Canterberry has a video on it. I posted in the wrong thread too sorry. I watched the vid and it shows a couple problems I imagined. The leather has to be elevated in the SP for the awl, hand. The holes are pre punched. using the slats, the idea was to establish a stitch line right at the wood edge, a thin slat so the awl and needle have clearance to work, and could be clamped tightly to hold the thin edges of any length without repositioning, or need to tug / hold the leather with off hand to make the punctures. It might not work, but in my head it works better than a pony for sewing thin stuff.